Tirumala Tirupati Devasthanams TTD Accommodation and Tirumala Rooms online booking procedure in ttdsevaonline.com website…..
TTD seva online is Tirumala Tirupati Devasthanams Seva. TTD Seva online is established to reduce the queue lines & waiting time of pilgrims. In this TTD online portal the pilgrims are provided with Darshan slots before the pilgrims reaches Tirumala. TTD Seva online is started & maintained by Tirumala. Tirumala Devasthanams Board. This project was initiated in 1998. 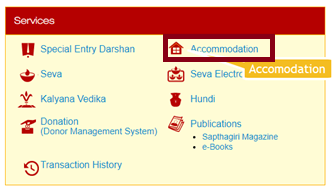 Guidelines for Tirumala Rooms online booking of Seva / Tirumala Accommodation – To get online benefits of TTD Seva, the pilgrim has to register with TTD. After TTD Seva Login registration with TTD Seva, username & password is provided to pilgrims. There is a condition of providing one Seva for one registered pilgrim user which he has to avail within 180 days of quota availability. After successful booking of pilgrim email configuration will be generated to respective mail ids & pilgrim’s reporting time details will be mentioned in booking receipt. TTD Accommodation Rooms Booking & guest house booking at Trirumala & Trirupati Devasthanam. Kalyana Vedica for marriages in Trirupati. Hundi – Donation directly to corpus fund of Temple. TTD Srivani seva Ticket availability. Uaikunda Ekadasi, Uaikunda Dwadasi – These are celebrated in the 1st week of January & numerable devotees arrive and have darshan of Venkateshwera Swamy. Radha Saptami –On this auspicious day around 2 lakh pilgrims arrive & worship Shri Malayappa Swamy with Bahudevi & Sridevi. Poornima Garuda Seva –It is believed that on full moon day Malayappa Swami appear on Garuda, So this day is celebrated by devotees whole heartedly. e-darshan counters – The e-darshan counters are available almost everywhere, there is a list of cities / towns having e-darshan counters – Adilabad, Amalapuram, Ananthapur, Bangalore, Bobbili, Bhopal, Chennai etc. Near 1 -2 lakh pilgrims come to have darshan of lord Vankateswara.To reduce the waiting time TTD has been established. It is considered as the best scheme by which pilgrims have benefitted a lot. It is an important and quite helpful for the pilgrims to book the accommodation for Tirupati well in advance especially during the festival season where the number of pilgrims visiting Tirupati is very high. Tirupati trust has built comfortable accommodation for the pilgrims at a very low cost. It has built 7512 cottages, guest houses and choultries. TTD also provides accommodation free of cost for the people who can’t afford. Apart from these there are public amenities which provide dormitory type accommodation with locker facility, free of cost. Pilgrims can do an online booking in advance for a maximum of 90 days. After clicking on Tirumala accommodation, the person needs to select the place pf accommodation from the drop down and the date for the Tirumala Rooms Online Booking of accommodation. The dates are colored with different colors, green means the accommodation is available, red means it is occupied etc. Apart from this, the person needs to select the time slot of check-in, number of persons and whether the booking is made for self or for others. After selecting all of these the person needs to click on “continue”. After successful payment, an accommodation ticket is generated which is also shared on the registered email-ID. One can take the print out of the same and use it while visiting Tirupati.